About Chawal Ki Kheer Recipe | Rice Kheer: One of the most favourite Indian dessert, made quickly and easily with just a few ingredients. Chawal ki kheer is the perfect dish to celebrate a festival or any joy or just cook it up as an after-meal dessert at home. Kheer is basically rice pudding made across India, it is simlar to rice payasam made in South Indian homes. Ingredients of Chawal Ki Kheer (Rice Kheer) Recipe: Fragrant Basmati rice simmered in whole milk sweetened with sugar and flavored with green cardamom powder, garnished with slivered almonds and lightly roasted whole pistachio nuts. 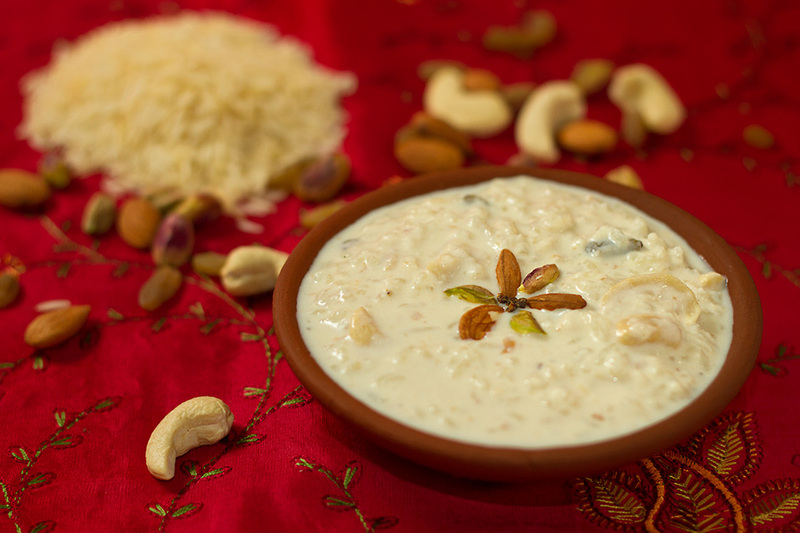 All of this together makes for this delicious Kheer recipe. 1.Pick, wash and soak rice for 20 minutes. 2.Drain and rinse the rice again and set aside. 3.In a heavy bottomed pan, boil milk add the drained and rinsed rice. 4.Simmer it for 20 to 25 minutes, stir continuously. Add condensed milk. 6.Add sugar, cardamom powder and slivered almonds. Mix thoroughly. 7.Serve hot or chilled garnished with slivered almonds and roasted whole pistachio nuts. You may add broiled saffron, if desired. You may add rose water to further enhance its flavor. Ensure that you use a heavy bottomed pan, in order to prevent the milk from burning or sticking to the bottom of the cooking pan used. You may add lesser quantity of sugar as we are using condensed milk in its preparation. Ever thought about cooking Kheer with Paneer? Yes, you can have your very own Paneer Kheer at home. Payasam is a south Indian version of Rice kheer and we have got 5 best recipes of cooking Payasam at home.